Back to basics - the omelet is the perfect meal to start the day - a filling and nutritious breakfast for your whole family. It is also great for a busy day when cooking is the last thing on your mind. It is simply a lifesaver. 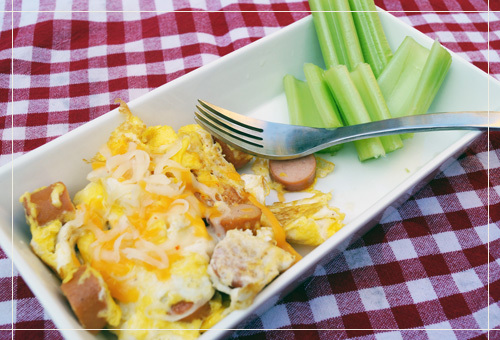 This sausage omelet also makes a quick and satisfying dinner that everyone enjoys. It will certainly rise to the top of your family's dish favorites. It is a recipe that our family regularly comes back to, so why not give it a try? This meal is tasty and flavorful and combines well with celery sticks and mozzarella. In a large non-stick skillet over medium-high heat melt the butter and cook the sausages until golden (about 2-3 minutes). Top the omelet with grated mozzarella. Use a spatula to slide the omelet onto a plate and serve. Garnish with the celery sticks.